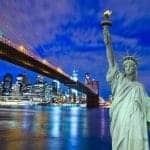 City Sights NY is the trusted name in sightseeing in New York City. They are a member of NYC & Company, New York’s official tourism marketing organization, and their philosophy is to provide the highest quality services at the fairest prices possible. Their deluxe motor coaches and double-decker buses are uniquely designed with seating on the top deck only to provide you with the best views of Manhattan’s attractions, neighborhoods, and places of interest. Guides are carefully chosen and well-trained to provide you with a fun, interesting experience. Use a City Sights NY coupon to save on your tour!